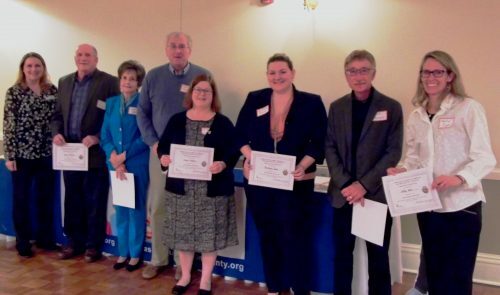 More than 50 volunteers, staff, family court judges and board members attended the 2018 Mercer County Advocate Appreciation Awards dinner on April 9 at Mercer Oaks Clubhouse in Hamilton Township on April 9. CASA for Children of Mercer and Burlington Counties is celebrating the volunteers with years of service pins and certificates. The awards dinner was a wonderful evening to recognize the tireless work of volunteers who are the consistent adult in children’s lives while in out-of-home placement. The evening was particularly special because CASA honored Judge Audrey P. Blackburn, who is retiring after a distinguished judicial career – much of it devoted to improving the lives of children in foster care to create forever families. Judge Thompson also made some brief remarked and thanked the volunteers for their compassion and tenacity.